DEFINITION: "The sometimes subtle art of making a firearm reach it's highest possible level of performance, reliability, and esthetics". 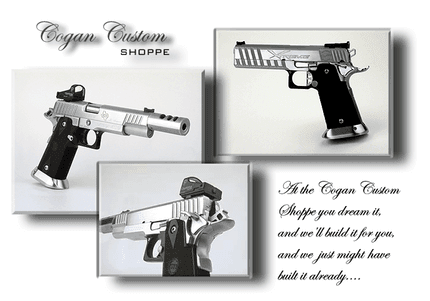 A very small selection of what we do, pictures speak for themselves... Just a simple reminder we are Custom Gunsmiths. We not only make Custom Guns but we offer and still do the standard everyday work that Gun Smiths do; Such as tune-ups; Trigger jobs; Barrel fitting; Scope mounts; Repairs like poor feeds; Stove piping; and fixing magazines to work right. WE are masters of the upgrade like better sights, better grips and Checkering, Stippling etc.. Plus we do a lot on hunting guns and shotguns because Bob hunts and uses a shotgun a lot. Been there , Done that!